Thank you to everyone who entered last week's Coton Colors Holiday Ornaments Giveaway! One generous TSR reader will win a $45 gift card for a college team ornament to keep and another to give as a gift. Congratulations, Jamie! You'll receive an e-mail shortly with details about how to claim your prize. 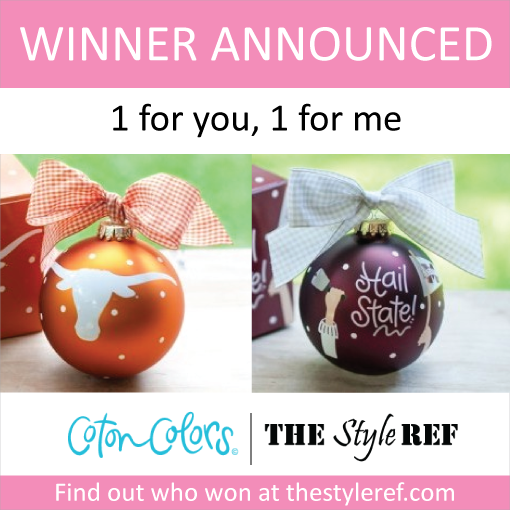 Once you get your ornament, share a photo of it on TSR's Facebook, Twitter or Instagram (#TheStyleRef)! If you're looking for a special holiday gift for college sports fans that can be treasured for years to come, check out Coton Colors' collegiate collection.